A lot of people ask me if this image is "Photoshopped". Photographers and clients mean completely different things when they say "Photoshopped". Photographers want to know about the level of difficulty in retouching such an image, while everyone else wonders if the bride was superimposed to an ocean background in Photoshop to look like a mermaid. I'm happy to explain. The Mermaid happens to be Nathalie, a beautiful French Canadian bride from Montreal. The shot and the settings are very spontaneous and natural. It all took place in a whimsical hair salon in Montreal that had a saltwater fish tank. The preparations for the wedding that included putting on the dress and doing hair and makeup lasted for few hours. During that time, I was wondering how to incorporate the fish tank into the photos and I have to be honest, although I knew an image was there, I wasn't sure what image it was. After trying various compositions, I almost gave up. The idea came suddenly when our bride was fully ready to go, at the moment when she started walking towards the exit. I happened to be on one side of the aquarium and the bride on the other. And that's when it struck me! A mermaid! This photo was taken through the double glass of the aquarium. Notice the uneven reflections of the dress. 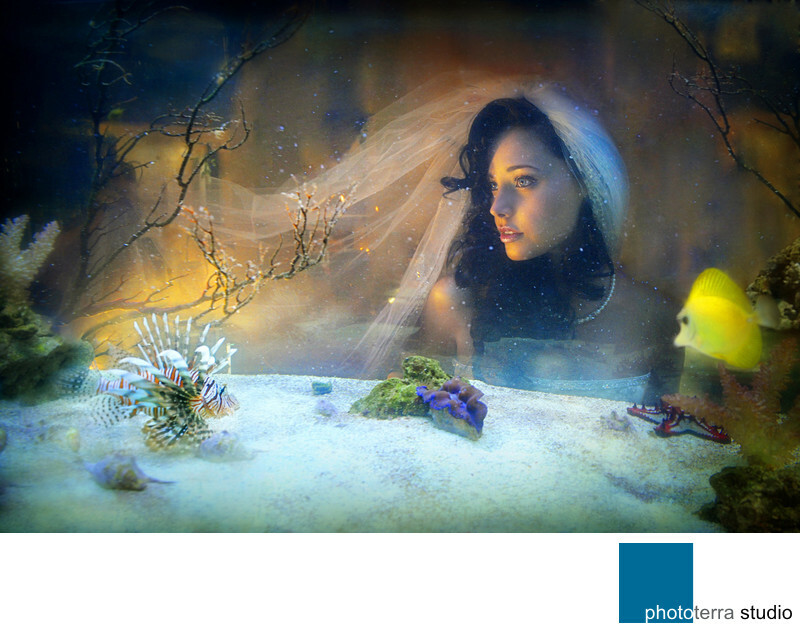 With the help of my assistant who simultaneously was holding the light and the veil, the mermaid was discovered. In terms of retouching, there was barely any, I blurred the hand of my assistant holding the veil, the rest is a natural setting at a very lucky moment. This photograph later went on winning multiple awards and accolades and became a staple image of my studio, Phototerra. It also helped me a lot at establishing my brand.